CopRice nutrition and technical service manager Jess Revell. 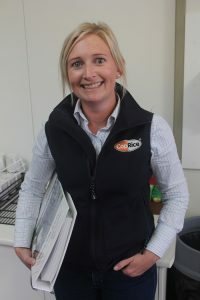 HIGH goat meat prices have opened up opportunities for producers to utilise supplementary feeding, according to CopRice nutrition and technical services manager Jess Revell. Ms Revell said supplementary feeding of goats can help meet market targets sooner. She said inquiry from goat meat producers about pellets had increased by 5-10 percent in the last two months and dairy demand had lifted about 25pc in the last 12 months. In April, the National Livestock Reporting Service said over-the-hook goat indicators eased slightly from the previous month, averaging 648c/kg (12-16kg cwt), though remaining 122c/kg cwt higher year-on-year. In May, prices bounced back, with the eastern states indicator averaging 658c/kg cwt. This week eastern states goat meat grids for 8.1-20.1kg-plus carcases ranged from 540-750c/kg and averaged 656c/kg. Click here to get the latest Sheep Central story links sent to your email inbox. Speaking after a recent Victorian Farmers Federation goat seminar at Horsham, Ms Revell said the principles of the sheep-focused program Lifetime Ewe Management principles could be extended into the goat world, but there was not a lot of goat nutrition research being done. “We are using NRC 2007 (National Research Council – Nutrient Requirements of Small Ruminants) for most of those nutrient requirements. She said there was a need among goat producers for more awareness around the value of condition scoring as a good indication of nutrition status. Ms Revell said goats have different nutrition requirements with a more enhanced digestive system than sheep with a high affinity for fibre. “They have lots of cellulitic bacteria so they digest fibre better. Ms Revell said the goat pellet business is huge and growing. A lot of kid mortality in goat herds can be attributed to poor nutrition, she said, so pellets are used generally at weaning to enhance rumen development and growth rates. Ms Revell said goats also had a high affinity for protein, essentially by-pass protein. Rangeland goat research has demonstrated that goat growth rates increase with supplementary feeding. A series of trials have been commissioned by Meat & Livestock Australia, with support from the Goat Industry Council of Australia, to investigate the growth rates of young rangeland goats with and without supplementation. A previous article can be read here. MLA said with good returns, rangeland goat meat producers are increasing their level of management intervention in their herds. For example, some producers are improving genetics, such as in Boer goats, while others are trying supplementary feeding to enhance the growth of undersized goats. However, MLA said little is known or documented about the growth rates of young goats, with or without supplementary feeding. This makes it difficult to develop industry recommendations that can make supplementary feeding accessible to all producers and increase supply to service overseas markets. AusVet, GrazServ and the Eulo goat depot have teamed up with producers from sites in south west Queensland (Eulo, Cunnamulla and Dirranbandi), south east Queensland (Warwick) and Griffith, NSW, to investigate this issue. The trial has been underway for six months and examined the growth rates of 768 rangeland goats. Goats were fed with 1-2pc of body weight commercial goat pellets daily for three to six months. The results demonstrated that goat growth does increase with supplementary feeding, MLA said. These goats weighed 15kg on average at the start of the trial. At the end of the trial, goats that received supplementary feed weighed 26.8kg. Un-supplemented goats weighed 25.2kg. 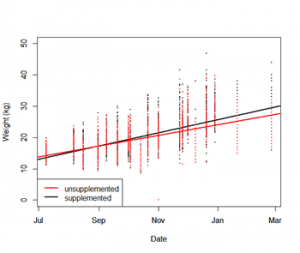 Allowing for site differences in climate, pasture and feeding levels, goats that received commercial pellets in addition to normal pasture were less than 1kg heavier than goats that just received the same pasture. See Figure 1. Figure 1: Plot of weight of goats by time and treatment group. Table 1 – Median start and finish weights of goats in supplemented and un-supplemented treatment groups. MLA said the research provided good Australian scientific evidence that commercial rangeland goats can produce more when supplemented at pasture. Unfortunately, it appeared that the growth rates achieved are not high enough to be financially beneficial, when feeding relatively expensive commercial pellets. The next several months of the trial will concentrate on using very inexpensive, locally available feed supplements, such as cotton seed, to see if goats can still benefit in growth rate. This will allow more economical feed sources to be examined and to determine whether supplementary feeding can be financially beneficial for producers. G’day. The goat industry could do well to access all the unpublished data from the trials done at Condoblin all those years ago by Dr Peter Holst. When we were breeding meat goats prior to the Boers coming to Australia, the key we found was the milk supply from the doe and the ‘frame’ of the buck. We found over time that protein=fat, especially in the Boers. The benefit of goat meat is the low fat content, which is normal in destination markets, as they feed on the lowest feed value pastures. This is the reason our feral goats were in such high demand. The best local market is Farmed kid. We were achieving 20 kg liveweight at 12 weeks.